Lobbying groups representing the U.S. tech and healthcare industries are recognized as the top-performing trade associations inside the Beltway, and the best positioned to drive members’ agendas on Capitol Hill, according to an annual research study of Washington policy leaders released by APCO Worldwide. APCO’s study ranked the efficacy and influence of various advocacy groups in D.C. by measuring their performance across 15 different characteristics — everything from multilateral impact to coalition building to media relations to self-regulation — in a bid to determine how much impact those associations have in shaping policy in the eyes of stakeholders. For the last three years, organizations representing the healthcare industry have won as the top-performing lobbying sector. For the first time, however, technology beat out healthcare as the most effectively-viewed advocacy area, taking top slot in grassroots, events, media relations, bipartisanship, social media, self-regulation and as an industry reputation steward. Healthcare, meanwhile, won in multilateral impact, lobbying, local impact and an information resource. 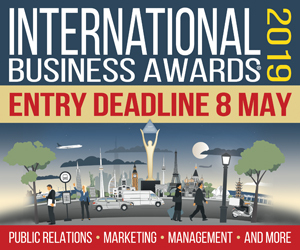 Financial services and energy and extraction were also advocacy sector winners in several categories. APCO’s survey also identified the ten specific associations seen as top performers across those characteristics. 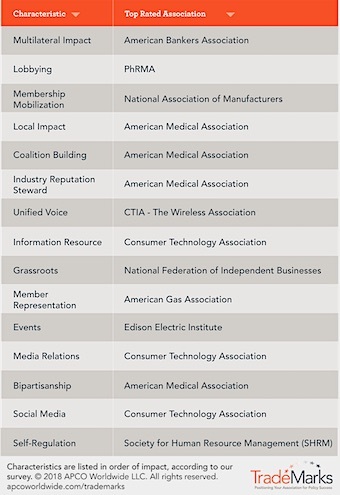 The top-ranked associations were the American Medical Association (taking the top slot in four categories) and the Consumer Technology Association (winning in three categories), followed by the American Bankers Association, PhRMA, the National Association of Manufacturers, CTIA, the National Federation of Independent Businesses, the American Gas Association, Edison Electric Institute and the Society for Human Resource Management. APCO’s annual TradeMarks study surveyed 340 policy congressional staff, executive branch officials and private sector executives. Research was conducted by the agency’s in-house research team, APCO Insight.